There tends to be 2 groups of how people look at building wealth. They might eventually reach the same state of wealth, but the probability of success for these 2 group of people might vary. The first group is what I would term the Dreamer Wealth Builder. They tend to be more sensing and feeling folks, and their trigger point would be more inspired by stories, hearsay from friends and family, articles that they read on Facebook linked by their friends. They also tend to discount the past and present, and strive towards the future. The future in all their hopes, will be different from what happens in the past and present. If they only have $300 in net worth they yearned for the $1 million dollars to reach financial independence. The second group is what I would term the Realistic Wealth Builder. These folks tend to be more calculative and somewhat more pessimistic or should I say cautious in how they evaluate the stories and information that comes along their way. They tend to have a rather dim view of the world, or that their thinking is mostly the situation would not get any better than this. The future will be exactly like the present. In both Dreamer and Realistic, it is not to say that their economic situation is bad. They can be in a bad, average or reasonably good situation in their take home income, family financial situation and their prospect. Much of their outlook depends much on their personality, how to world influence them, critical past experiences and their influences while they are younger. Reject past failure to build wealth, more oriented towards building wealth in the future Ability to build wealth depends on past and current ability to build wealth. Realistic wealth builders tend to see in the future their situation will be same as now, they will be more inclined to make do with what they have now. They start creating a plan, no matter how vague, to work with the resources they have. They create simple systems or processes. And its often these simple system or processes that becomes the flywheel to build great wealth. The dreamer wealth builder will have it more difficult, because they will be hoping for the next increment to be good, then they will start. Or that their next job hop to bring in 10-20% increment, then they will start implementing. Due to their calculative and harsh reality based nature, the Realistic Wealth Builders tend to have more realism in what they can achieve. Due to that, whether its disappointment or optimism, they know it outright, or become a big enough pushing factor to create some life shifting actions. Take the same realistic wealth builder. With his take home pay of $3000, he will think his pay would not increase much more than 3% per year. So he got to work with what he has. His research tells him that if he invest he could probably get 5-6% return over 10-20 years but will he be competent enough to achieve that? So he estimates that if he invest, he will grow his money at a 2.5% return per annum. He starts seeing if he can put away $1000 per month into stocks, whether he can live with $2000 in expenses. He then works out that if this sum grows conservatively at 2.5%, in 10 years it is $134,441 and in 20 years $306,536. If the wealth grows more than 2.5% then its a good bonus. He can be happy with $306k in 20 years. He could vary the figures to $750 per month and will get $100k in 10 years and $230k in 20 years. That is slightly less, than $1000 per month and since he can save $1000 and have $200 per month saved for rainy days or emergency, he will put $1000 away monthly. realistic: he knows its not a far fetch figure since he has done a back of an envelope calculation what he can conservatively achieve, what if he falls short of 2.5% and what with it really hits 5%. Its not a number pluck out from the sky. There are little room to feel disappointed in the end, and if there is, it is if he is forced to not make that $1000 per month amount into stocks. While the the realistic wealth builders are cautious about their wealth, good wealth builders have a away to reduce the anxiety that usually comes with being pessimistic. James Clear wrote in this Lifehacker article that through centuries, our anxiety have helped us get away from danger. These stress, anxiety are supposed to help us in an immediate return environment. 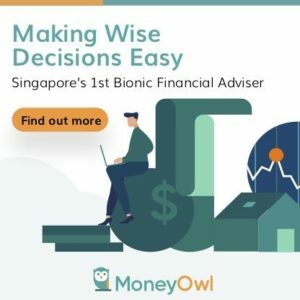 However, in today’s delayed return environment, where we are unsure whether we will eventually build our target wealth, these stresses creates anxiety. How do we as humans alleviate these negative responses. 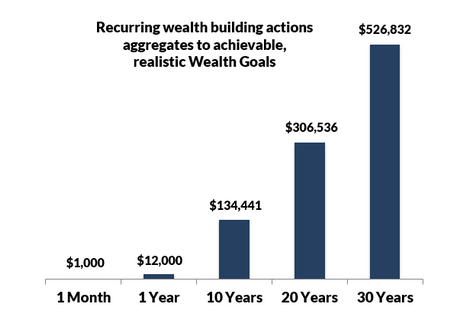 One aspect of what the realistic wealth builders does well, is to measure their wealth build. The S.M.A.R.T goals setting of a far goal, and near term milestones ensures less surprises, but also guidepost to adjust the strategy or plans when you do not meet the milestones. The act of measurement takes an unknown quantity and makes it known. When you measure something, you immediately become more certain about the situation. Measurement won’t magically solve your problems, but it will clarify the situation, pull you out of the black box of worry and uncertainty, and help you get a grip on what is actually happening. This is where the Dreamers will catch up because some of these opportunistic threads that come along their way, once developed enough, may result in those goals coming through. Many of the success stories that were spammed in Facebook and other media are by entrepreneurs taking the road less travelled, taking more uncertainty in their careers to get to where they are. Conservative and harsh realism does not always result in the kind of astronomical wealth that you see in the papers. Whether you belong more to a Dreamer mentality or a more Realistic mentality, it is important to know the various things that makes wealth building a success. Dreamers can build great wealth if they take something that is common for the realistic folks, and the realistic folks can do better if they have more controlled optimism in their daily encounters. Whether how you slice it, whichever method, if you don’t have the above 4, realistic or dreaming, you won’t even start building wealth. So which type of wealth builder are you leaning more to? Do you disagree with this classification after looking at your peers, family and friends?